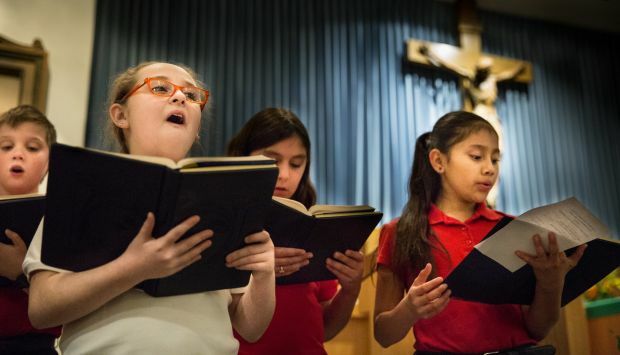 ST. LOUIS (CNS) — While the timing of the grand jury decision involving the Michael Brown shooting remained uncertain, Catholic schools in the Ferguson area were already prepared in case the ruling comes down with classes in session. “We have our safety plan in place,” said Addie Govero, the principal at Blessed Teresa of Calcutta School. Blessed Teresa is about two miles from the site of Brown’s death and subsequent unrest. Our Lady of Guadalupe School is only slightly farther away — about two and a half miles. When the grand jury decision on whether to indict Ferguson Police Officer Darren Wilson in Brown’s shooting death is announced, the safety plan will unfold. At Blessed Teresa, the plan is for school to stay open, with parents having the option of picking up their children. The much-awaited decision by a St. Louis County grand jury was expected by the end of November. The August shooting of 18-year-old Brown, who was black, by Wilson, who is white, gave rise to weeks of protests, violence in the streets, and looting and vandalism of Ferguson businesses. Activists threaten more such action if the grand jury does not determine the officer should be brought up on charges. The teen was unarmed, but police say Brown struggled with Wilson before the officer fired. Missouri Gov. Jay Nixon Nov. 17 declared a state of emergency and activated the National Guard to assist local and state police in the event of civil unrest. In anticipation of rioting, safety is the primary focus at Blessed Teresa of Calcutta School, first for students and followed closely by faculty and staff. Many of the safety features already are in place, the reality of schools in 2014 after shootings across the nation at all levels of the education system. Like other schools, Blessed Teresa has a buzz-in system for anyone coming in the front entrance, and other doors into the school are locked. Nevertheless, staff members will be on duty at those entrances and on the alert for anything untoward outside. While parents can pick up their children before dismissal, a contingency also is in place for parents unable to arrive by the end of the school day; for instance, if roads are blocked by protests or otherwise gridlocked. “We have a plan if students have to stay later,” Govero said, noting the school has “food and drinks if we would have to supply them with dinner and those kinds of things. More difficult throughout this ordeal has been how to talk to the students about it. With kindergartners through eighth-graders, Blessed Teresa and Guadalupe have a wide range of age groups, from 5 or 6 years old for younger students to those 13 or 14 years old in the upper grades. “We speak to our kids depending on what’s appropriate for their age,” Govero said. “For older students, when we go over procedures, we can tell them we’re preparing and what’s going on, and they can share things concerning them. Though teachers and staffers have been open and available to discuss the situation with students, they haven’t started the conversations, allowing students the space to be, well, students. And there is a chance that the preparations might be for naught. Public school officials recently asked St. Louis County Prosecutor Bob McCulloch that the decision be announced on a weekend, so as not to disrupt school. Luecking writes for the St. Louis Review, newspaper of the St. Louis Archdiocese.